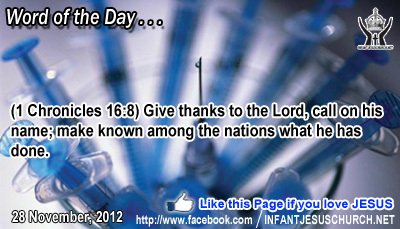 1 Chronicles 16:8: Give thanks to the Lord, call on his name; make known among the nations what he has done. Holy and Righteous Father, bless all those who serve you in complicated places today. We especially thankful for all the missionaries sharing the grace of Jesus with people who need to recognize you as Abba Father. Empower their words, protect their lives, and bless their attempts with fruit. Please help us to understand that true thankfulness engages sharing your grace with others. In Infant Jesus' name we pray. Amen. 12But before all this they will lay their hands on you and persecute you, delivering you up to the synagogues and prisons, and you will be brought before kings and governors for my name's sake. 13This will be a time for you to bear testimony. 14Settle it therefore in your minds, not to meditate beforehand how to answer; 15for I will give you a mouth and wisdom, which none of your adversaries will be able to withstand or contradict. 16You will be delivered up even by parents and brothers and kinsmen and friends, and some of you they will put to death; 17you will be hated by all for my name's sake. 18But not a hair of your head will perish. 19By your endurance you will gain your lives. Martyrs who shed their blood for Jesus Christ win great success, not only for themselves, but for the entire people of God. The martyrs overcome Satan by continuing suffering and death through their faith in Christ who died and rose for us. And through their observer many others recognize the victory which Christ won on the cross. The martyrs are eyewitness to the truth - the truth of Jesus and his power to defeat sin, fear, hatred, violence, and injustice, and even death itself. What gives courage and self-assurance to the martyrs is the firm hope in the resurrection of Jesus and the assurance of eternal life and unending joy with God. He may call some of us to be martyrs for our faith. But for most of us, our call is to be 'dry' martyrs who bear witness to the joy and power of the gospel in the midst of daily challenges, contradictions, attractions and adversities which come our way as we follow the Lord Jesus. God will give us enough grace, strength, and understanding to face any trial and to answer any challenge to our faith. Are you ready to lay down your life for Christ and to bear observer to the joy and liberty of the gospel? Loving Infant Jesus, by your atoning death on the cross you have redeemed the world. Fill us with joyful hope, courage, and boldness to witness the truth of your love for sinners and your triumph over the powers of sin, Satan, and death.